Attending a conference like VidCon can wear a person out – especially if the person is not the predominant target. With the majority of attendees being teens and pre-teens that are exceedingly enthusiastic about the YouTube celebrities, it’s far to easy to overlook what is truly special and energizing about this movement. Vulture’s Bryan Moylan attempted to do this and, while he did capture some solid elements, they were nowhere near what the reality was in the Anaheim Convention Center. By actually attending VidCon, there are no promises that an older generation will completely “get” what’s going on. But, the sooner everyone realizes that the motivations of the majority generation of VidCon attendees is drastically different than the generations that came before, we’ll be quicker to get into the media innovations that will truly make a difference in the future. One would think that being a part of the Industry Track – the most expensive entry – would count as being a bona-fide member… The thing is, being away from the groups of Creators and Community meant more than being on a different floor physically – it meant being in a different thought process of why people would want to participate in mediums that are so self-celebratory. 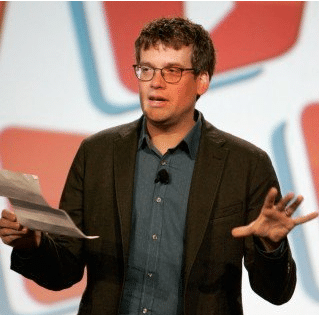 Even though John Green (VidCon Co-Founder as well as the writer of Fault In Our Stars and a business partner with his brother, Hank, in starting VidCon as well as a burgeoning video/content industry) mentioned in his Industry Track Opening Keynote that only 18% of their company’s revenues came from advertising revenue, so many of the following tracks allayed the conceit that, somehow, we need to figure out how to work the traditional forms of media into this new phenomenon. Attending VidCon confirms that the traditional media conceit will absolutely not work among this crowd, nor any crowd/generation beyond it. Certainly, there were numerous speakers that tipped their hat to a need for change in the way big business is done. We all know that it is easier and/or quicker to promulgate change when you are not really a part of big business (yet), but it was disheartening to hear from some brand people about how they needed to break into the content and disrupt the movement that is disrupting the norm. It just isn’t gonna happen. Vulture’s Moylan does capture some essence from afar as it relates to the community that this community is a part of – one of shared experiences among large crowds that, without the internet and the new mediums, they would have not had the opportunity to connect with. Absolutely, there are chances to expand upon social good and education in addition to entertain. You just can’t overlook what this movement is writing the book on – true audience development. As long as we keep our way-we’ve-always-done-it hats on, they are all looking to be movie stars. Take those hats off and we see it for what it is – people using a medium to build and foster audiences in ways that couldn’t be done previously. The most important thing to Creators – at first, at least – is gaining and fostering their audience. With relatively basic, YouTube-integrated products, they are more successfully doing what large brands with huge amounts of data and resources aren’t even aware that they need to do. In the same way that Creators are working exhaustively to build an empire that they have no idea where it will lead them, the Community is looking to support and look up to those who put themselves forward in authentic ways.